My garage is split into two 12x18 rooms. The front half is my workshop area, which right now is predominantly filled with woodworking machinery. 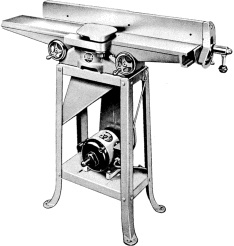 I'm a fan of old woodworking machines, so most of my machines are older than I am. This part of my garage is also where all of the domestic stuff hides out during the winter as well.